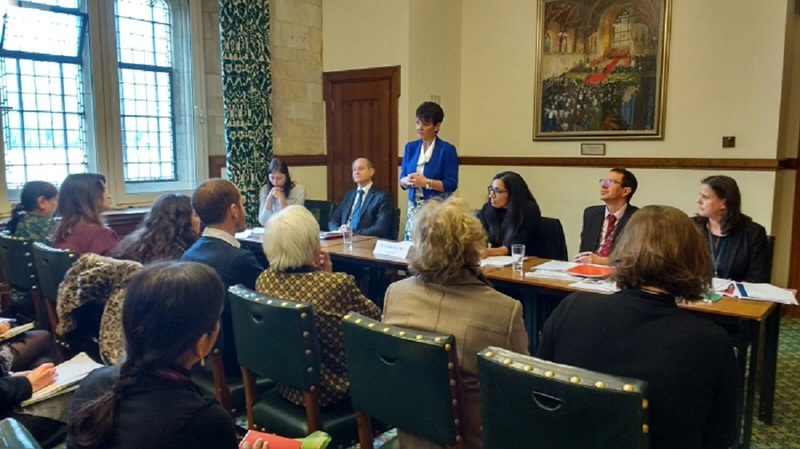 On Tuesday 19 December 2017, the All-Party Parliamentary Group on Women, Peace and Security (APPG-WPS) and GAPS co-hosted the Government’s 2017 annual report to Parliament for 2017. The Foreign and Commonwealth Office, the Ministry of Defence and the Department for International Development presented their progress in implementing the 2014-2017 UK National Action Plan (NAP), the final report for this NAP. Baroness Fiona Hodgson of Abinger CBE, co-Chair of the APPG-WPS, opened the event. She emphasised that women’s voices must be heard and acted upon, and cited the consultations run by GAPS and its members as a particular highlight of 2017. Women’s rights organisations and women human rights defenders are doing vital and brave peacebuilding work. The consultations were an opportunity to bring their findings and recommendations to the UK Government’s policy-making processes. Lord Ahmad of Wimbledon (FCO) acknowledged the importance of ensuring women’s equal participation in post-conflict peacebuilding and restated the UK Government’s commitment to work in collaboration with and across departments as well as with civil society. 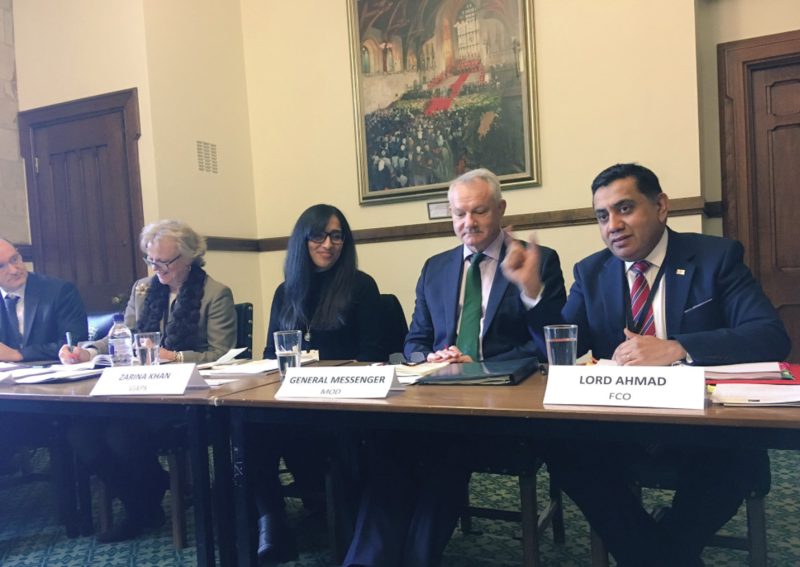 Lord Ahmad drew attention to priority issues covered in the UK Government’s report, for example working with the United Nations to address sexual exploitation and abuse perpetrated by UN peacekeepers. General Sir Gordon Messenger (MOD) highlighted the progress on WPS that has been made within the MOD and the British armed forces. The MOD is increasing the number of gender advisers in the British military, and will work towards the delivery of gender training pre-deployment and incorporating gender into training on the laws of armed conflict. General Messenger echoed Lord Ahmad on the frontline role that the UK must play to prevent sexual exploitation and abuse by UN peacekeepers. Finally, he outlined targets for women’s increased participation in the armed forces, for improved collaboration and information sharing within UK Government and for WPS to be mainstreamed into UK defence plans. Matthew Wyatt (DFID) drew parallels between the UK’s work on WPS and the development process for DFID’s new Strategic Vision for Gender Equality, noting that gender-based violence is one of the most widespread human rights violations in conflict-affected contexts. DFID’s humanitarian work has pushed for awareness of the specific needs of women and girls and recognises that women’s participation in the design and implementation of humanitarian response is vital. Mr Wyatt also acknowledged the importance of tackling root causes of gender-based violence. Helen Stawski (International Rescue Committee, Europe), presented findings from the report No Safe Place: A lifetime of violence for conflict-affected women and girls in South Sudan. This report was produced as part of the What Works to Prevent Violence Against Women and Girls (VAWG) consortium. Ms Stawski highlighted that the international community’s focus is often on the perpetration of VAWG by armed actors yet the most common form of violence is intimate partner violence, and levels are shockingly high. The study found that levels of VAWG in South Sudan are as high as 65%, among the highest rates in the world. The report recommends that tackling VAWG should be central to all humanitarian response. There should be gender training for security personnel, and donors should ensure that funding is multiyear, accessible to in-country grassroots organisations and require collaboration with local women’s groups to support existing work and build local capacity. Furthermore, Ms Stawski recommended that programmes targeting VAWG should be integrated with those addressing long-term community-based peacebuilding. Zarina Khan (GAPS) welcomed the presentation of the UK’s annual report as practice of an open and accountable government. Ms Khan presented the GAPS 2017 Shadow Report, which identifies areas of progress and concern. For instance, she highlighted the positive development of GAPS’ relationship with the cross-Whitehall WPS team and supported commitments made to changing internal cultures and attitudes on gender equality. 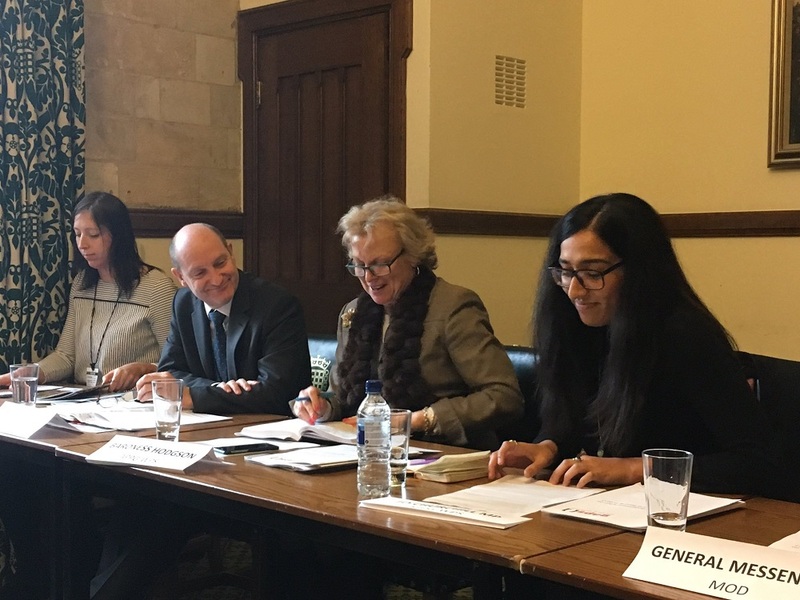 On countering violent extremism, however, Ms Khan drew attention to the ways in which current practices are not in line with WPS principles, and noted that women and women’s rights advocates should have space to influence all UK Government decisions relating to peace and security. Finally, she challenged the UK Government on its support for Saudi-led airstrikes in Yemen, which is inconsistent with its commitments to peace. In Yemen the UK is falling short of its obligations to prevent the occurrence of violent conflict, undermining in the process its own humanitarian and WPS efforts. Zarina Khan called for the UK Government to meet its ambitions not only by listening to the voices of women in conflict, but by acting on them too. The FCO-funded projects to consult with women’s rights organisations and women human rights defenders set an important and welcome precedent for the UK’s NAP development process. GAPS hopes to see this investment in women’s voices continue, and to see action on the recommendations from the consultations. Jo Churchill MP, Chair of the APPG-WPS, closed the event by thanking all those who presented. She commended the UK Government for its collaboration with civil society actors, and called on the UK as a global leader on WPS to lead by example in providing the space and access necessary for women’s rights organisations to be involved in the design and evaluation of WPS policy and programming.